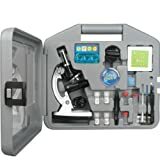 AmScope M30-ABS-KT2-W 300X-600X-1200X Metal Body Optical Lens Kids Student Beginner Biological Microscope Kit (UPC 608729747277) is sold at the following online stores. We've find the latest prices so you can compare prices and save money when making your purchases online. Please click on the links below to browse to each store's webpage.